Show Me the Way was beautiful and emotional. Just like every other A.L. Jackson book, it’s a slow way of telling a story with so much hope and love. I’m really loving that every book I have been reading lately have been wonderful. Rex and Ryanna’s story had so much heart, I loved them both so much. Then there’s Rex’s little girl Frankie, be still my heart. She was such an adorable little girl, so curious, loving and so sweet. Rex was such a worrier when it came to his little heart Frankie, but it’s understandable after what he went through and for a first time dad. Rex was a great of a dad, I couldn’t help but swoon for this man. He was a perfect package, once you get pass his rough side. Ryanna poor girl and everything she went through, she became such a strong person when she came back to town. She was no longer the pushover that everyone knew her as. She became an independent woman, who went for what she wanted. I love Rynna and Rex chemistry right from their first meeting, they had me. Their life and their love was beautiful. They were perfect together. When it came to how they felt for each other, it was easy, right when they let each other in 100%. Can I just say how much I hate what’s her name, what a witch. She is one of those characters that you just want to smack around and pull her hair out. I never hated a character so much until she came along. Oh wow. But Rynna and Rex were stronger together..nothing and no one could keep them apart. This second chance romance is a definite must read. Loved it. 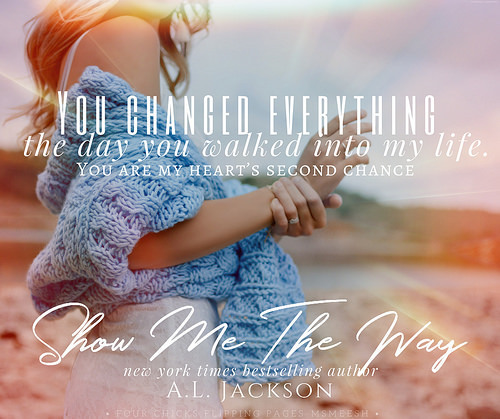 Show Me The Way by AL Jackson is an utterly raw, gripping, and emotional love story that was brimming with so much beauty, passion, and healing. Jackson takes reign as she enchants her readers with her stunning magnetic prose. This book was an emotional experience that consumes you to the core. Right away, Jackson made you fall in love with her characters: Rynna Dayne,Rex Gunner and his daughter, Frankie. Readers were able to feel for the characters as Rex and Rynna were two broken individuals who had their lives forever changed. Both with a haunting past and yet together they were able to find solace, peace, comfort, hope and love. I know I am being super vague as to what to expect but this book was everything you could have asked for from AL Jackson. Show Me The Way showed readers that life is definitely a journey. When one door closes, another opens and another. And for Rex Gunner, his second chance to heal, forgive and love began when Rynna walked into his life and made her mark on his heart. So if you are looking for a book where the writing was consuming and the story was absolutely beautiful then this book is for you.